Sponsorship Policy? Yes, we have one too. Let me take a few minutes to tell you all about it. We now accept sponsorship requests from high-quality establishments within each the pet category. "Site Sponsors" are supporters from the pet industry. The website Total German Shepherd accepts sponsorship requests from high-quality establishments within the dog niche or category. 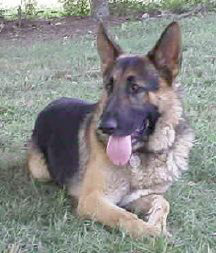 "Site Sponsors" are supporters from the German Shepherd Dog product industry. These sponsors all form an A-list of German Shepherd Dog top related services. This exposure in the right hand column alone can easily provide the sponsors with increased visibility of their products (a valuable service in a site that now exceeds well over 1300 pages). Keep in mind that not all advertisers will be accepted. If you enjoy total-german-shepherd.com, please support our sponsors. You will be delighted that you did! If you sell goods, products or services to German Shepherd Dog owners and lovers, and if you would like to know more about "Total German Shepherd Advertising" by sponsoring Total-german-shepherd.com, please click here. total-german-shepherd.com is now accepting a limited number of sponsorships on an exclusive basis. You must truly have an excellent product or service to be promoted on this website. We will not work with a company that would result in our visitors having a sub-par experience during their visit here. If interested in advertising, please contact the exclusive local agent of total-german-shepherd.com by completing the form below. Together, we can build a program that both brands your business and markets your product straight to your prospective audience. If you are already a Site Sponsor, we want to thank you for your support too!